Author Expo 2017 was the best yet! Can’t wait until next year! Thanks to this article, you can now get your copy of The Pie Sisters and Second Chances at Elm Street Books in New Canaan, CT.
Symposium’s Picks: What’s Hot at the Bookstore This Week. Who better to recommend a good read than a bookstore? Symposium Books is spreading the word about The Pie Sisters! A huge thank you to “Talk of the Town” Bruce Newbury for speaking with us about our new book, The Pie Sisters. A summertime story set on the shores of Canandaigua Lake in New York state’s Finger Lakes region, The Pie Sisters seems to resonate with anyone who knows the joys of lakeside living and the almost universal language of this very special world. There’s nothing risky about reading Second Chances, the debut e-novel from Leigh Brown and Victoria Corliss. On the contrary, this compelling story of three people struggling to dodge their respective past, present, and future faux pas, will appeal to anyone who’s ever made a mistake in life. And honestly, is there anyone out there who can say they haven’t? Looking to make a fresh start and a brighter future for herself, a young Pashmina leaves her family and home to create a new life free of heartbreak and conflict. Now a successful author skilled in the art of mystery writing, it seems there’s little she can’t do– except outrun her past. Amelia, Pashmina’s young editor, isn’t sure if it was luck or skill that earned her the top spot working with the Mistress of Mystery but she’s thrilled regardless. It’s the opportunity of a lifetime. Now if she can just keep her insecurities in check, what could possibly go wrong? Her boyfriend Tim knows. He’s spent a lifetime building an impermeable emotional fortress around himself making him invincible, invulnerable. But what’s it gotten him and at what cost? Three lives tightly entwined become quickly entangled and soon they all find themselves wishing for a second chance. Purchase your copy of Second Chances today at https://www.smashwords.com/books/view/357298. Leigh and Victoria live with their families in Rhode Island. To learn more about Second Chances and forthcoming novels from the Brown/Corliss duo visit browncorlissbooks.wix.com/secondchances or email them at browncorlissbooks@gmail.com. “One chapter has ended another is starting. Let’s hope the reading is good.” So read 18-year-old Victoria “Vikki” Stone’s (Corliss) senior quote in New Canaan High School’s 1982 “Perranos” yearbook. Three decades later, following a successful career in public relations, marriage and a family, Corliss is still an avid reader, but now she’s a writer too. 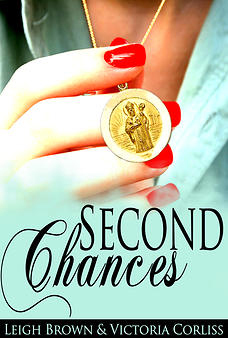 “Second Chances,” released in September, is the debut e-novel from Corliss and her co-author, Leigh Brown. “‘Second Chances’ is a story about getting a new lease on life, new beginnings, and that’s exactly what this book is for us,” said Corliss. Following long careers in public relations for Vikki, and finance/interior designer for Leigh, and with sons headed for college, they were ready to chart a new course for themselves as well. The decision to write a book was a natural choice for both of them and a lifelong ambition of Corliss’s. “When my family moved to New Canaan in 1976, the first thing I did was create a ‘writing room’ in my bedroom closet,” she said. “It was a small space, but it had everything I needed, including a light and a door for privacy. I was determined to write a best-seller. “‘Second Chances’ is 100% fiction, but we couldn’t have written it without the benefit of having lived what I like to call high definition lives filled with sights, events, food, and people that bring so much color into our world,” she said. This is the first literary collaboration for Corliss and Brown but not their last, according to a release. Their second novel, “The Pie Sisters,” set in New York’s Finger Lakes region, is slated for release in 2014. “Second Chances” is available at Amazon, Barnes & Noble, or Smashwords for downloading to all e-readers such as Kindles and Nooks, tablets, including iPads, and to computers in PDF format. CUMBERLAND – For aspiring authors, putting pen to paper is often the easiest part, as the nation’s handful of major publishing houses do not freely dole out book deals. Bowker, the country’s official ISBN Agency and leading provider of bibliographic information, reported in October that the number of self-published titles in 2012 was more than 391,000, which is an increase of 59 percent over 2011, and a whopping 422 percent over 2007. One of those Smashwords e-books was “Second Chances,” a novel written by Cumberland resident Victoria Corliss and Leigh Brown, of East Greenwich. The co-authors, who met while their sons were on the same baseball team and immediately bonded over a shared love of books and writing, decided to use Smashwords as they stepped into the self-publishing world because of the site’s user-friendly aspects that walked them through marketing, legalities and registering the book’s ISBN with the Library of Congress. “Let’s face it, we needed ‘Self-Publishing for Dummies,'” Corliss said with a smile.